The protagonist of J.R. Thornton’s debut novel, Beautiful Country, has a lot in common with the recent Harvard graduate. Chase Robertson is a fourteen-year-old tennis player training with the Beijing national team, a similar experience to Thornton’s own time playing tennis in China. The novel was first released there several years ago and recently brought to the United States by Harper Collins. 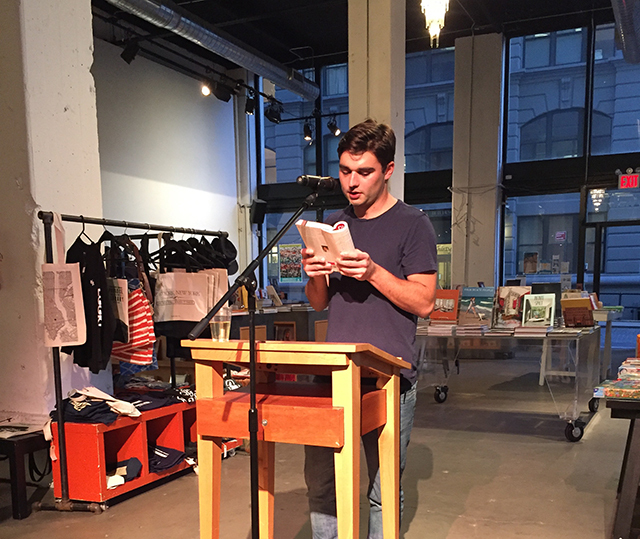 Thornton launched the American version of the novel at Powerhouse Arena in Brooklyn. Thornton describes China during his time there as a transitional period for the nation. A decade ago, the free market was beginning to take hold in a lot of areas of Chinese life, but old institutions like the tennis team remained rooted in traditional communist values. In the Communist system, the team’s players were chosen based only on their skill and merit as players. The best who qualified received training regardless of where they came from. Young players would be assessed and recruited to play tennis in early childhood. They would be brought to the tennis center and trained every day. School was not an option, only tennis practice. Each year the weaker players were cut from the team. By then, they had no education and no skills other than tennis. Since getting cut from the team meant an end to training, many of the players lied about their age in order to remain in a younger division. It was a fact they were very open about. They might officially be several years younger than they really were, just to gain an edge. For Thornton, it was an attitude that he didn’t quite understand in sportsmanship. He spent a lot of time growing up in England where sportsmanship is taken quite seriously, he explains. Only later did he eventually understand the nature of these kids’ lives. Thornton was always impressed by the work ethic of the Chinese players. He was also struck by the hopelessness of their situation. He also says that his experience in China was very different than the kinds of things he read about the nation in the United States. In the US, China was portrayed as an economic juggernaut, and that was one side of China, but then he also saw people without running water. While the novel draws on his own experience, he chose to write it as a novel in order to make it easier for other people to consume. The early drafts began more like a memoir. He wrote it as a class project for his high school before putting it aside. In college he came back to the manuscript after having enrolled in creative writing classes. He shifted the manuscript to fiction because that allowed him more room to explore. When the novel was published in China, it had to first get approval of the censorship board. Thornton says he was somewhat surprised over what sections they censored and what sections they left alone. They did not take issue with any of the broad criticisms in the novel, but they often would pick at specifics. A phrase like “dirty street” would become simply “street.” Thornton says censors are particularly skilled at flipping the meaning of sentences to produce a more positive idea.